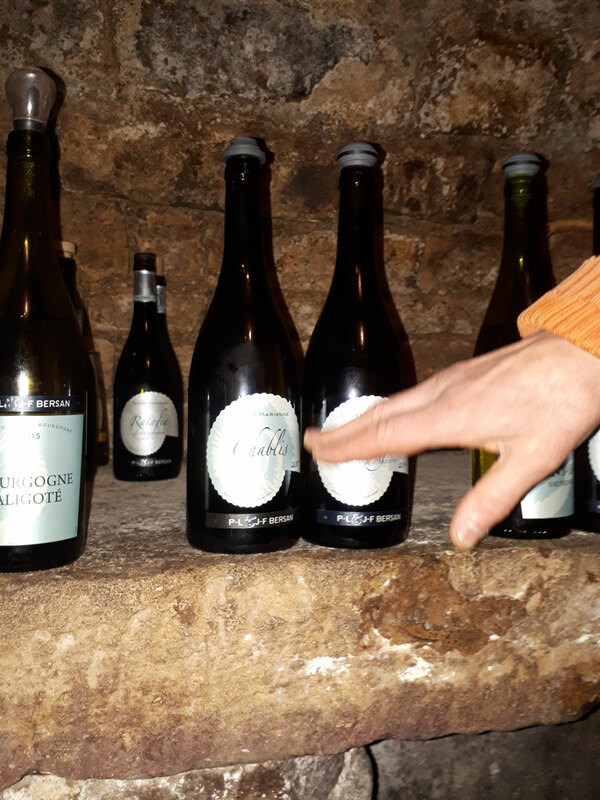 Having lived amongst the vineyards of Burgundy and on the edge of the Champagne region for over a year now, I really did feel it was time to take the plunge and find out what all the fuss was about with wine tasting that’s going around. 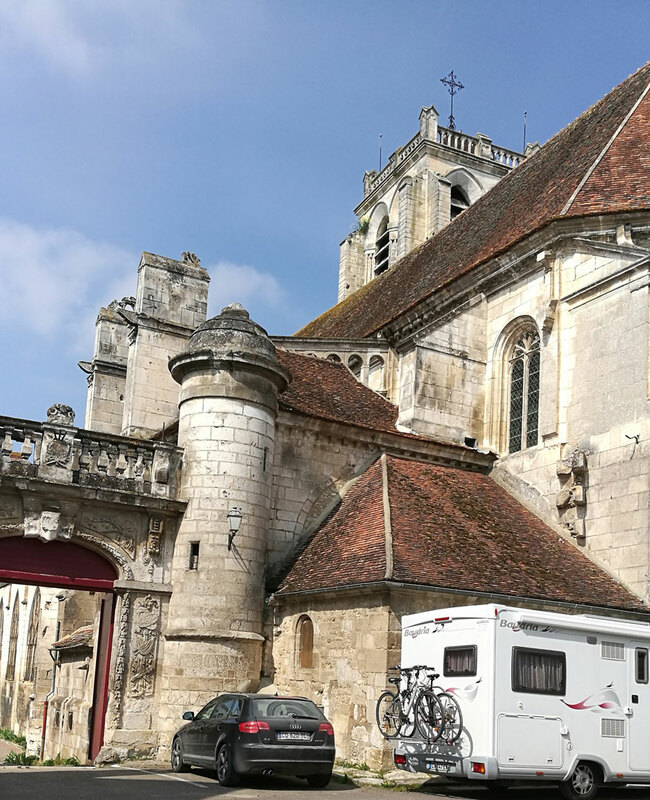 The winetasting we booked via the app was in the beautiful Burgundy wine village of St Bris, you might want to leave your motorhome at the edge of town! On travels through the little villages in France, I’ve often passed signs offering wine tasting but never quite had the courage to go in, so I decided to take my first step in to the world of the vignobles with the help of a very useful app / website I’ve recently found, www.ruedesvignerons.com/en. This site is great for us debutants as well as the more discerning wine tasters among us. You can select the region you’d like to investigate further, and book up a tour of your choice all in English and online. There are details about the different wineries with options of tours round the vineyards, tasting sessions and even meals to try! The site also gives you details about the wines that are offered in the wineries and their prices so you can select the exact one to suit your desires. So with a friend, we embarked on our trip of discovery! We chose to go and visit Domaine Pierre-Louis & Jean-François Bersan in Saint-Bris-le-Vineux, Burgundy. This was a free tour and tasting session with wines priced between €8 and €17 per bottle. Booking a tour was incredibly easy to do and I got confirmation email and text followed by a reminder the day before and the option to cancel if I needed to. The directions were sent to my phone as well so we were all set to go. The winery was very easy to find and we were greeted by Jean-Francoise who showed us round. Although Jean-Francoise spoke a spattering of English and our French is mostly limited to ordering coffees in cafes, having a personal one to one tour made all the difference, and between us we got along very well. Jean-Francoise’s winery goes back to the 12th Century and his family has been in the same location since the 1400’s. He is rightly proud to be the 21st generation in his family to be running the winery there and showed us around the historical cellars that run underneath all the houses, making the tour historically fascinating to see in its own right. Added to this, the wonderfully rich aroma of a very strong fortified wine called Ratafia emanating from the old oak barrels really set the senses alive! Jean-Francoise explained to us the complexities of the different elements that affect the flavours of the wine; not just the type of grape, but the weather that year, the location on the hill, the soil conditions as well as the age of the vines all change the taste and to demonstrate, Jean-Francoise selected several bottles of wine for us to taste and compare. I even got shown how to taste the wine properly so that I’m ready to look a real expert next time and there’s a video here for you to see too. Needless to say we both had an amazing morning and would recommend it as a great way to savour the true flavours of France and help to plan out an itinerary of places to go, especially in the wintertime when the weather is just in need of a warming nightcap. We left Jean-Francoise with a couple of bottles of our favourite wines, I liked the Bourgogne Aligoté, a white fresh wine (apparently goes very well with light fish dinners, although I thought is just was nice to drink on its own) and one that intrigued us both: Bourgogne Cote d’Auxerre Rouge 2014. Now, to be honest, we didn’t like the taste of this wine in the winery, it smelled beautiful but had a lot of tannin in it and dried out the palette when sipping it, however, Jean-Francoise explained to us that this particular wine was from an older vine and was meant to be enjoyed with a rich strong meal such as Boeuf Bourguignon so we decided to put his skills to the test! Having ‘acquired’ a wonderful Boeuf Bourguignon to enjoy back at our campervan (we could have spent hours making it but as we were actually in Burgundy, it seemed rude not to just buy one from a local deli), we plated up and tried it with the wine. Hands up to Jean-Francoise, he was absolutely right, the wine immediately improved the meal and tasted unbelievably different. So although we’ve discovered that there is so much more to wines than just the choice of white, red or rosé, and a lifetime wouldn’t be enough to take in all the information, at the end of the day, as Jean-Francoise assured us, it really is all down to personal taste and you can always rely on your friendly winery to assist you. Having a great time to discover the wines and speak to true artisans who have dedicated their lives to the enjoyment of bringing a good wine to the table was truly inspiring. And finally, if you want to look a true professional wine connoisseur, next time you’re having a dinner party, go to your local winery with the recipes for the meals you’re going to cook to ask them what to select. I can assure you, it will impress them no end and they will have a glint in their eye at the challenge. – Roots of a vine grow up to a meter a year so a 30 year old vine will have roots 30 meters deep. – Some of the flavours in the grapes come from the minerals in the soil it is grown in. – The older the vine, the less fruit it will produce but the more flavour it will have. – Wines taste significantly different with the right food! – When wine tasting – you don’t have to spit the wine out into the bucket if you don’t want to. – The mould that grows over the bottles that have been stacked up for years plays and important part in keeping the wine and shouldn’t be cleaned off – it helps to seal in the cork and prevent air from entering the bottle. – Have a small amount in the glass and hold the glass at the base so that your hands don’t warm it up. – Smell it – you’ll be amazed at the different fruits and aromas you can smell but the more citrus smells you can detect, the higher the alcoholic content and the less flavour you will get. – Taste it. Take a small sip and slurp it up like you would a hot coffee to add more air. Swish around your mouth so that the wine gets to all your taste buds. – At the end of the day…its entirely a personal choice and no two people’s tastes are the same, so you can either like it or not. Tip:- take a small notebook with you so that if you do like the wine, you can make a note of it or take a photo of the label! And always ask what food will complement the wine. ← Enter our 2018 photo competition and win a €350 holiday voucher!